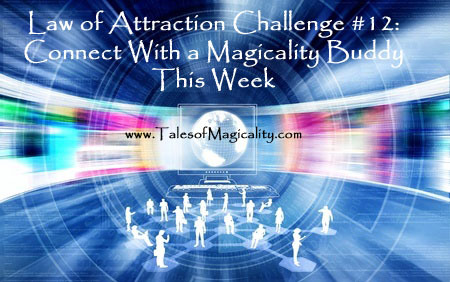 This weeks challenge is to connect with a Magicality Buddy! The Law of Attraction is a great tool to create the life of your dreams but sometimes you need help in seeing things that you currently can’t see. Sometimes it is easier using the law when you have a friend who can help you out in harnessing your power. That is why having a Magicality Buddy can really help you on your journey. By having someone or several buddies to bounce your thoughts and ideas about life onto, they can help you change words or habits that may be holding you back. So grab a like-minded friend who believes or perhaps connect with someone on our site here, and begin manifesting with love and friendships backing you up. You will notice that your buddy can really help you and that when you help your buddy, your life will be filled with gratitude–attracting more things for you to be grateful for. Good luck with your challenge & Happy Manifesting!